SPANISH LOCALS in Barcelona are begging the city council to crack down on the wave of anti-social behaviour demonstrated mainly by British holidaymakers visiting the city. A recent wave of accusations ranging from noise complaints to public urination have been directed at the Brit tourists. The recent discovery of a drug kit found in a children’s playground, attributed to British holidaymakers, has fanned the flames and has further damaged the reputation of tourists in the area. Barcelona residents have pleaded to city authorities that immediate action is required before irreparable damage is done to the capital of Cataluña. A growing ideology of ‘over-tourism’ is creeping into parts of the city as seen this past week when Ada Colau, the city mayor, was presented with a motion of censure and calls for her resignation for her lapse attitude to dealing with anti-social tourists and for the deteriorating state of security in the city. Last week a popular tourist spot in the city, Santa Caterina market, banned tourists from enjoying the fresh produce on sale, citing that a tourist-free market was crucial to the smooth upkeep of the market and that important measures had been taken to prevent over-crowding. Alfred Bosch of the city council claimed earlier this week that Barcelona could soon become the “drug capital of Europe” if major changes are not implemented to control the antics of visitors to the city. 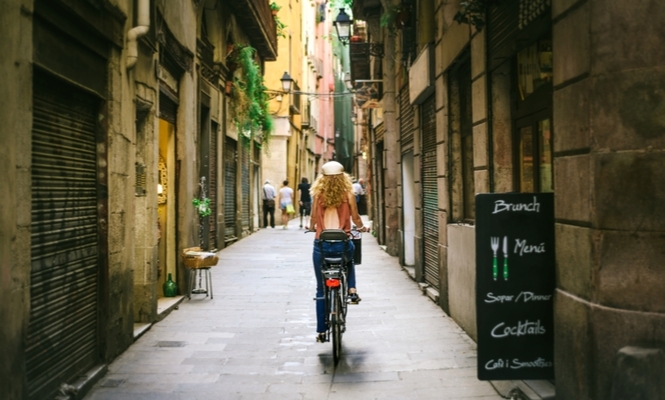 The overwhelming feeling of locals in the city is that tourists are drawn to Barcelona to exploit its lapse and lawless approach to dealing with tourists. The belief that tourists feel able to act in ways they would never act back home has angered many in Barcelona. The Catalans could be on the verge of taking action against anti-social tourist behaviour as seen last month in Mallorca where heavy fines were introduced to quell the growing number of tourist related incidents.